Like this beauty right here, from the grocery store…..Can you believe it? Isn’t it just a stunner? You should see how long it takes me to pick out a pumpkin. 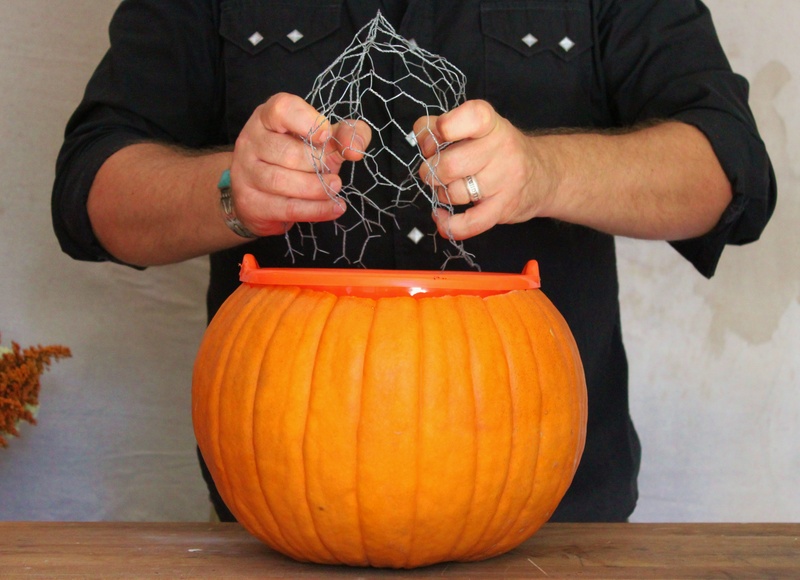 Since this ones is wayyyyyy too pretty to just carve into a Jack-O-Lantern……..I’m gunna fill this thing with flowers. 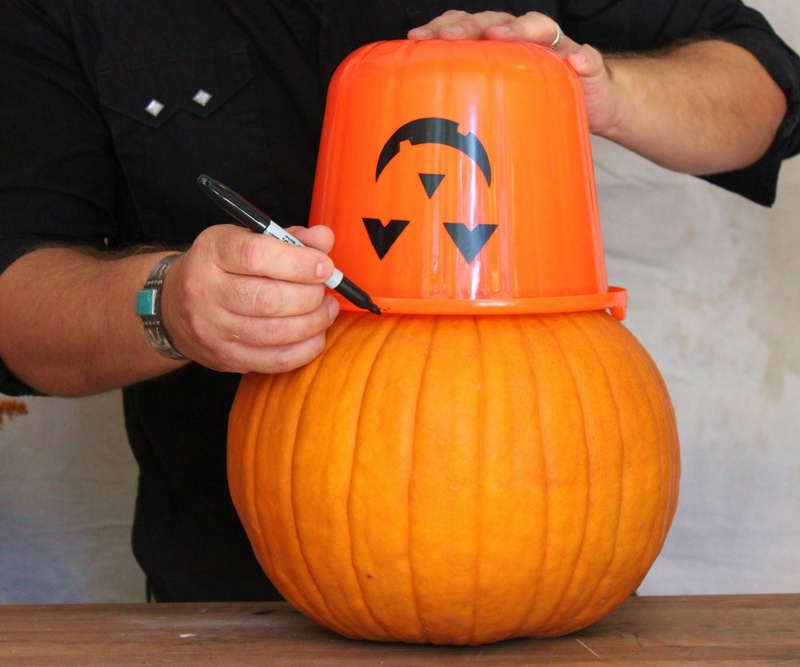 Pumpkins are great for making lanters…….not so much for holding water. 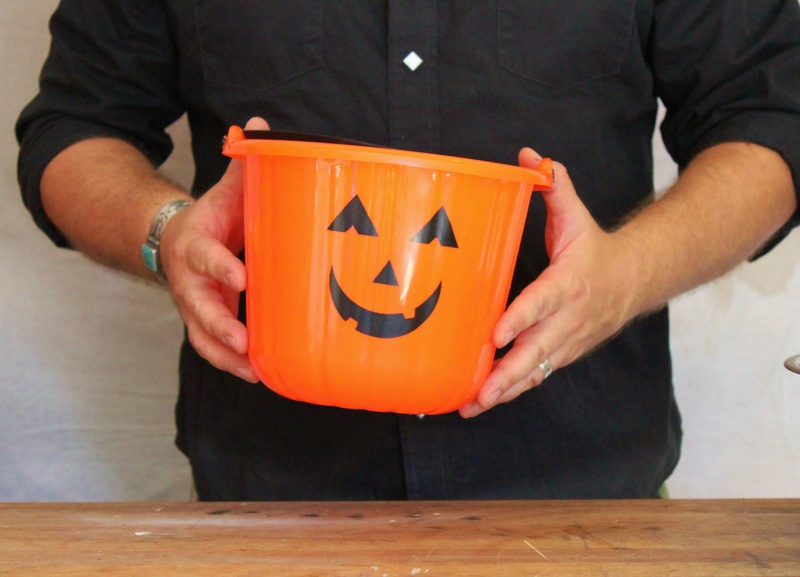 After rooting around store for water-holding options, we found this trick-or-treat bucket in the candy isle for 99 cents. 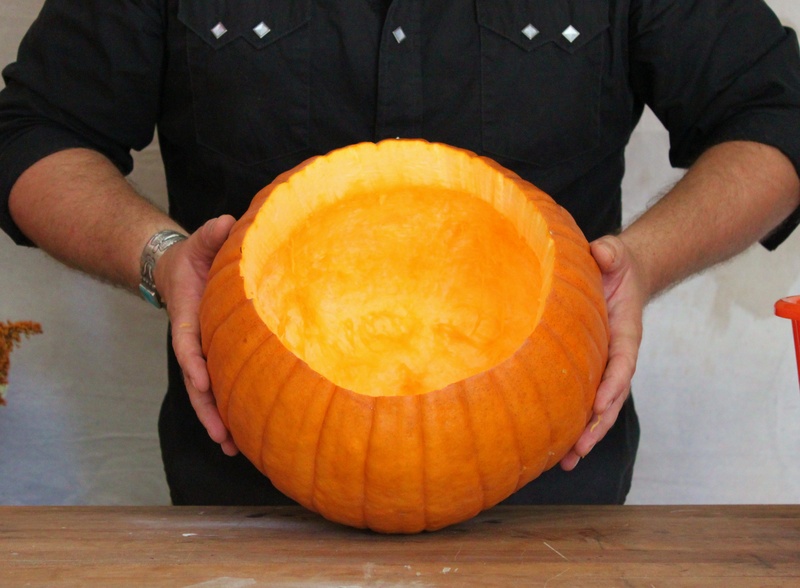 It’s just the perfect size to fit inside my pumpkin. I flip it upside down and use it as a template. 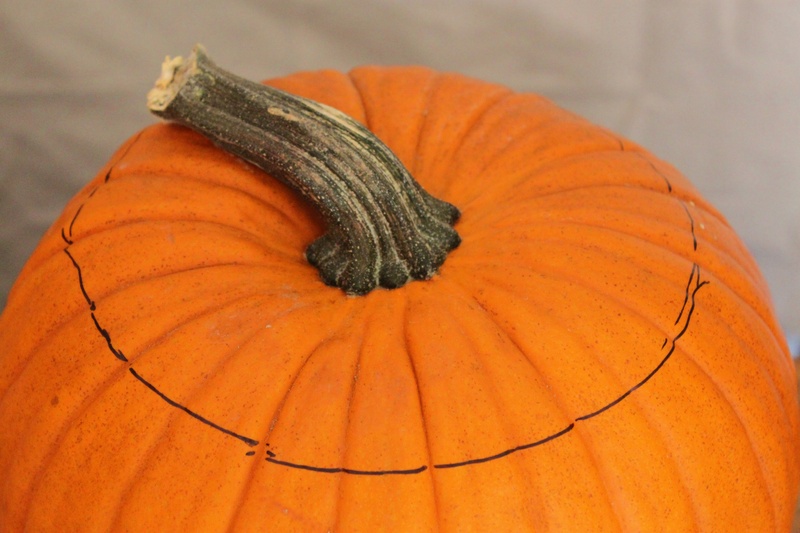 Marking my line for cutting with a sharpie. 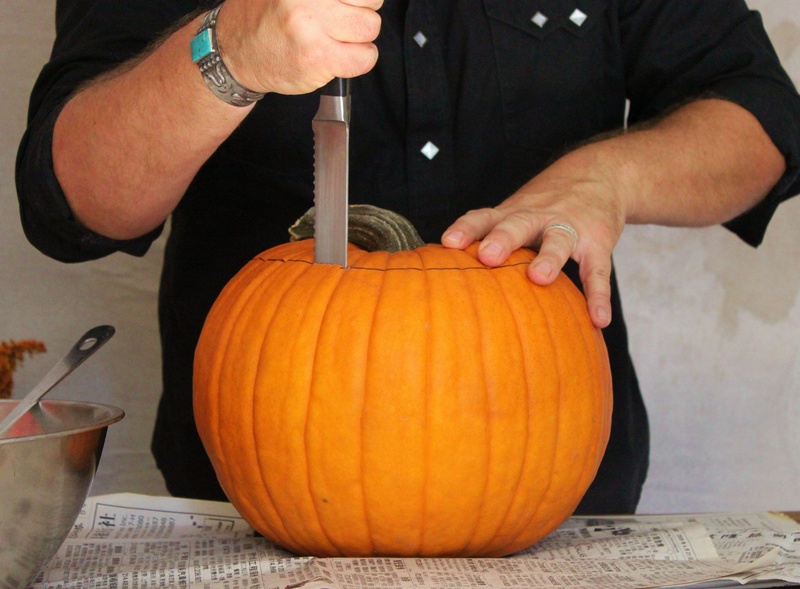 Not sure if y’all know this or not, but always carve a pumpkin with a serrated knife. It makes a world of carving difference. 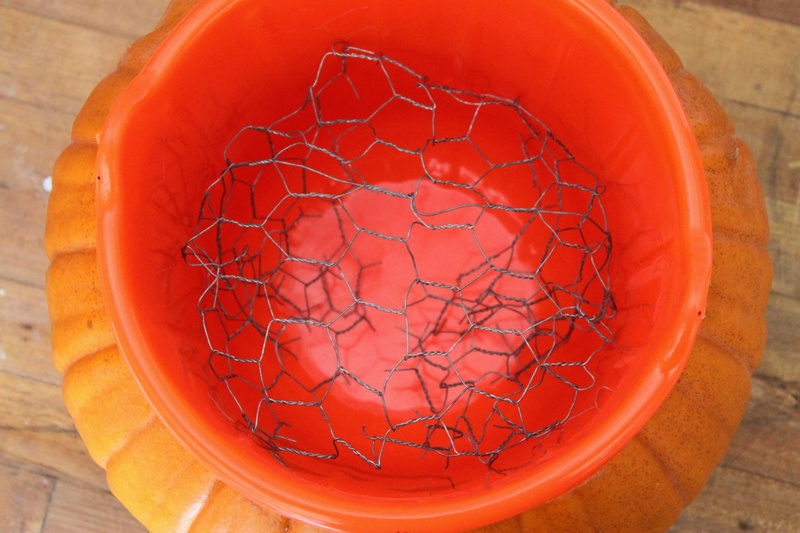 After scooping all the innards out, (I’ll save those seeds to roast later) I’m left with a perfect hole in my pumpkin for the plastic bucket. 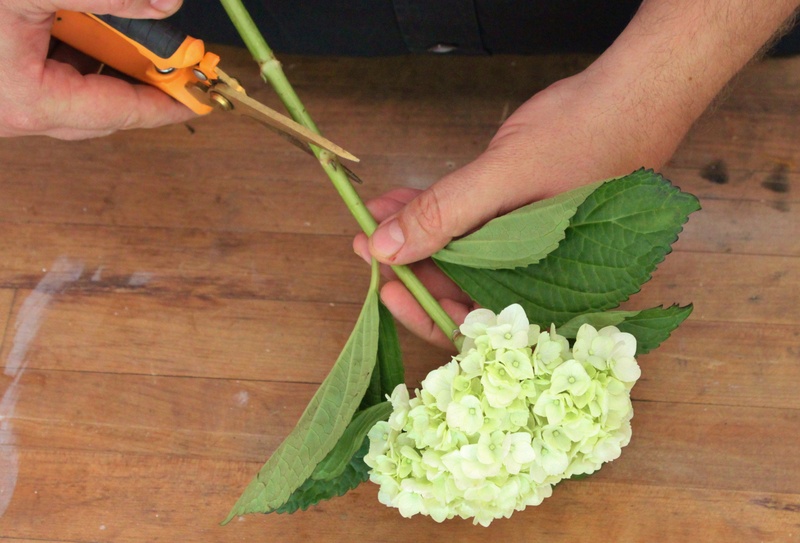 Here’s a little-known florist’s trick. 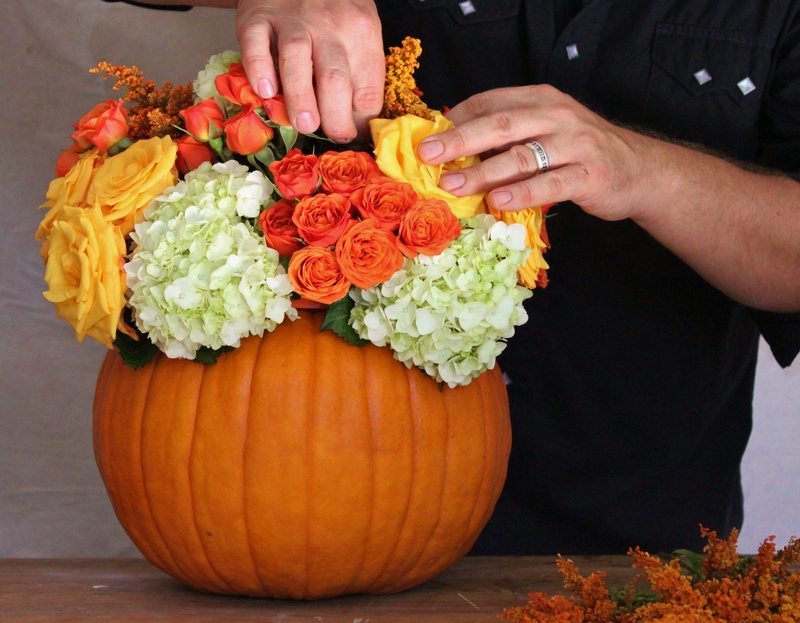 Use a piece of chicken wire as a guide for holding all your flowers in place. ……. and shove it inside the bucket. Then fill ‘er up with water. 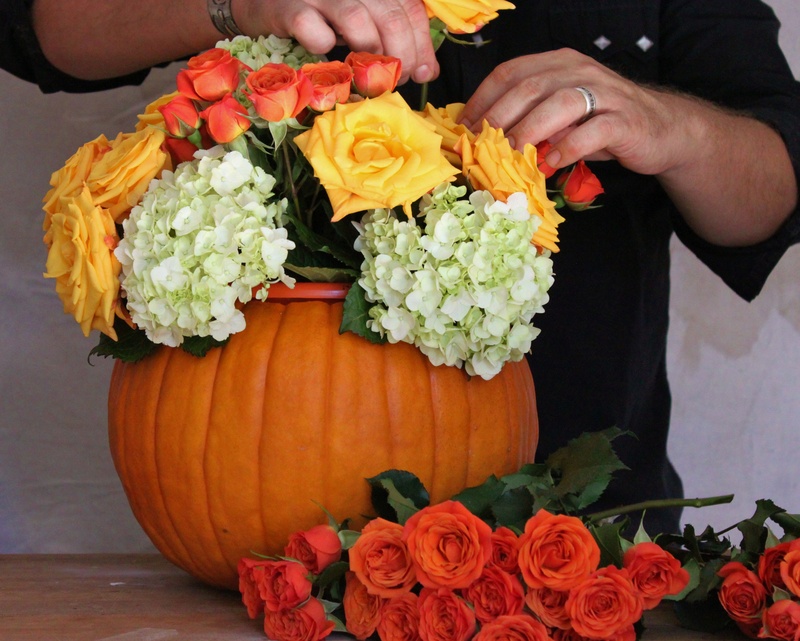 For flowers…….sure, I can go to the wholesaler. But wholesalers only sell in bulk. I don’t need 24 roses, and a dozen for 10 bucks is a pretty good deal. Here’s what 26 bucks got me at our local grocery store. What could be more boring. 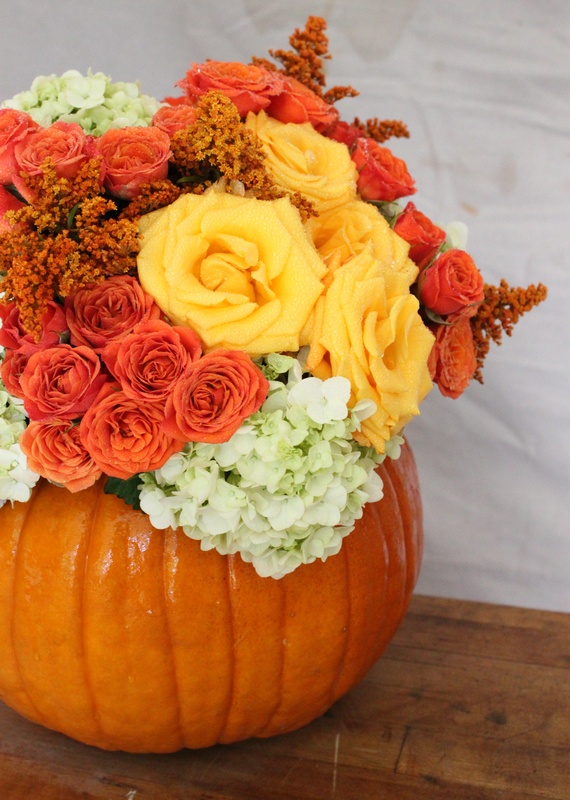 My pumpkin is orange, and I want my flowers to really stand out….not blend in. 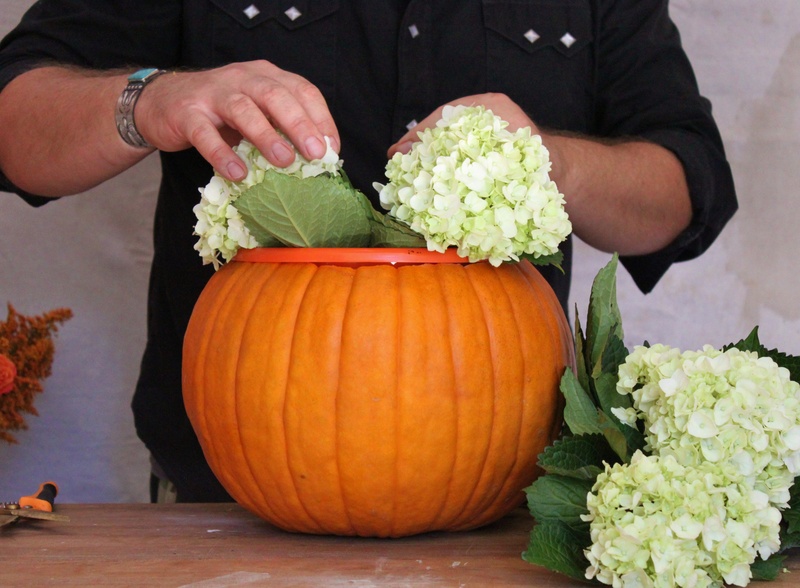 Start any arrangement with the largest flowers, like these white mini hydrangea. They’ll make a good base for holding the other flowers in place. 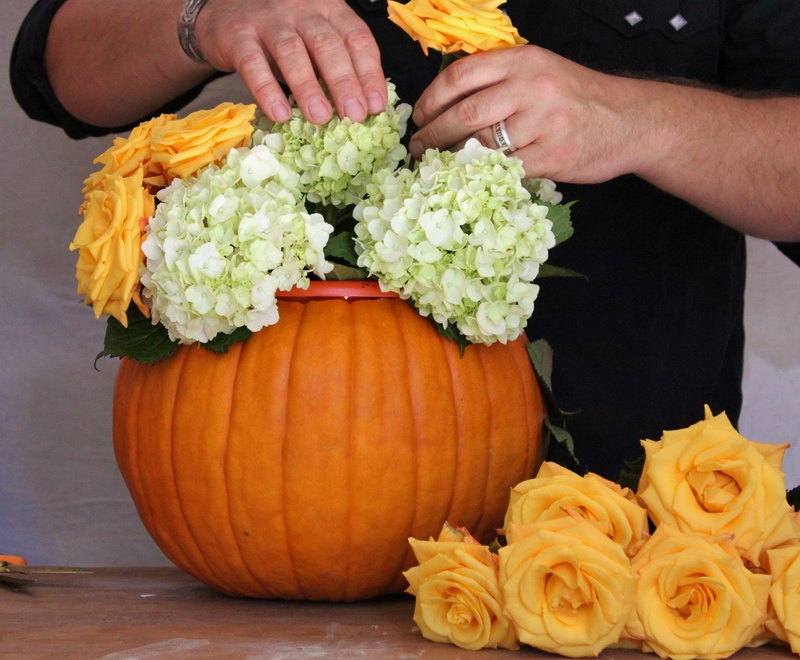 OOOOhhhh, be sure to always cut your flowers at an angle so they can soak up as much water as possible. Especially hydrangea. My roses really opened up overnight. 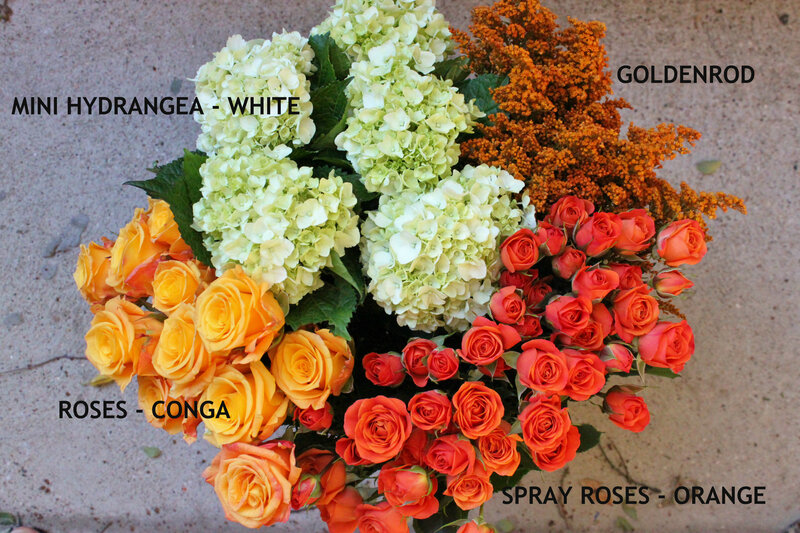 I add the “Conga” roses in small groups. 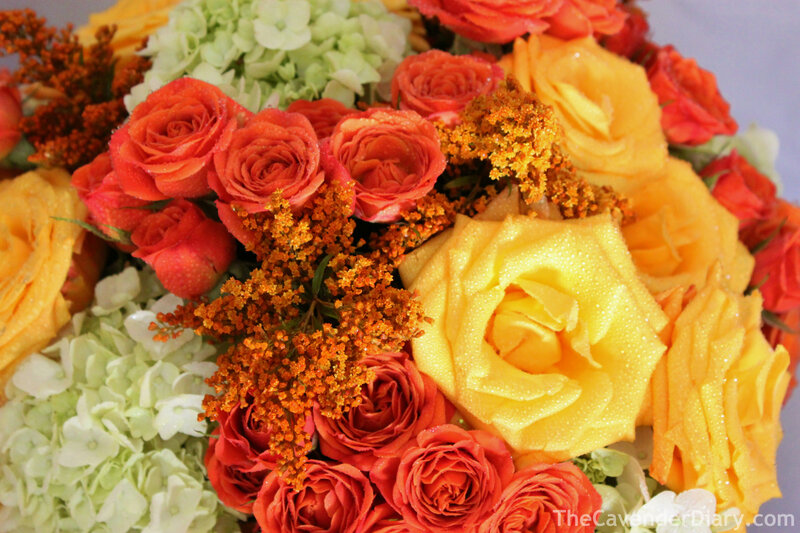 These orange spray roses will fill in any holes. The last thing I add is the goldenrod. Usually bright yellow, pretty sure this has been dyed orange……and I like that. That’s about all there is to this…. Pretty stunning for a 32 dollar investment. This is so lovely! I would love this for my holiday table. are you roasting the seeds for a tasty snack? I have a seasoning that you can use on them…chili lime-delicious! John. He has them laid out and ready to roast!!! 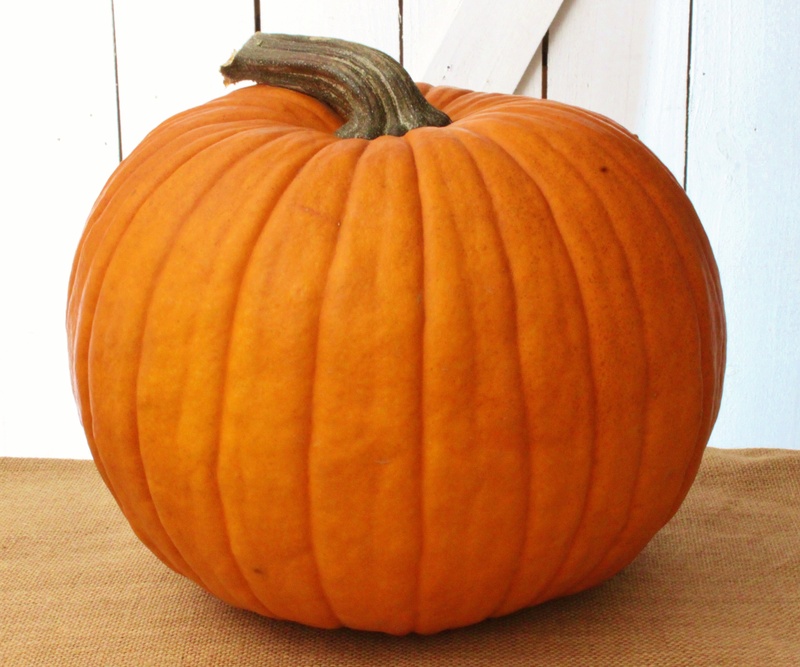 I was planning on roasting them in chipolte chili powder/smoked paprika and sprinkling them over the creamy pumpkin soup I’ll make with the roasted pumpkin my generous neighbors gave us…..
Wow – So pretty! I can’t believe you got all those flowers for $26. guess I’ll add flowers to the list of things that are more expensive up here. Boo. Oh.my.god. This is so so beautiful! Thank you for sharing! Beautiful! I learn so many things every time I read a post. I am going to do this today myself. Thanks for all the fabulous tips. Awwww, thanks Tracie. Glad that we can inspire! AB — Thought you might enjoy. Found this blog off of HOUZZ — and they have some good ideas. 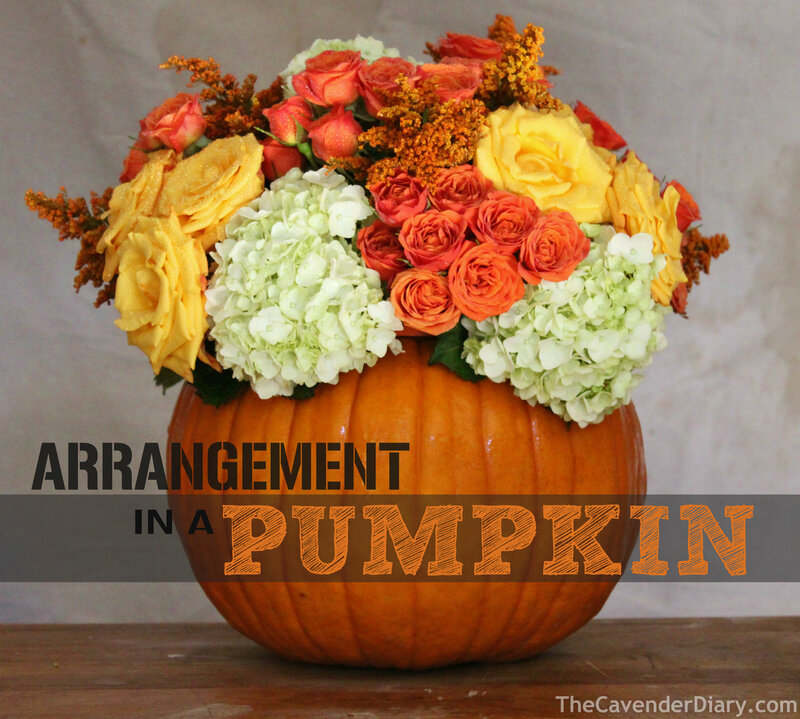 Thought my favorite flower arranger might enjoy this… Hope you’re doing well!